Tea is thought to have its origins in the mountainous region that stretches from northeastern India to China's Yunnan Province. Different processing techniques turn the tea leaves into a variety of products: green tea, oolong tea, or black tea. Tea made its first historical appearance in third-century Chinese literature. Originally used for medicinal purposes, its popularity grew along with the spread of Buddhist teachings (which prohibited alcohol). Because it was valuable, however, tea was drunk only among the upper classes; not until the seventh century did tea make its way into middle-class culture. The influx of Europeans and Christian missionaries in the sixteenth century made tea, along with silk, china and spices, a major trading commodity. In the early seventeenth century, the Dutch East Indies Company was particularly instrumental in bringing tea to the worldwide community. In Japan, the history of tea goes back to the Nara period (710-794), when Buddhist monks and students studying in Tang dynasty China (618-907) brought seeds back with them and began cultivating tea on temple grounds in Japan. When monks took their teachings to other parts of the country, they brought their tea with them, and by the Kamakura period (1185-1333) tea could be found nationwide. Tea became an everyday drink in the Edo period (1603-1867). Currently, over half of Japan's green tea is produced in Shizuoka Prefecture, with cultivation spreading as far north as Fukushima and Niigata prefectures. Sado (茶道 さどう literally "the way of tea"), developed gradually into a ceremony in which a host invited guests to converse while enjoying the pleasures of drinking tea. 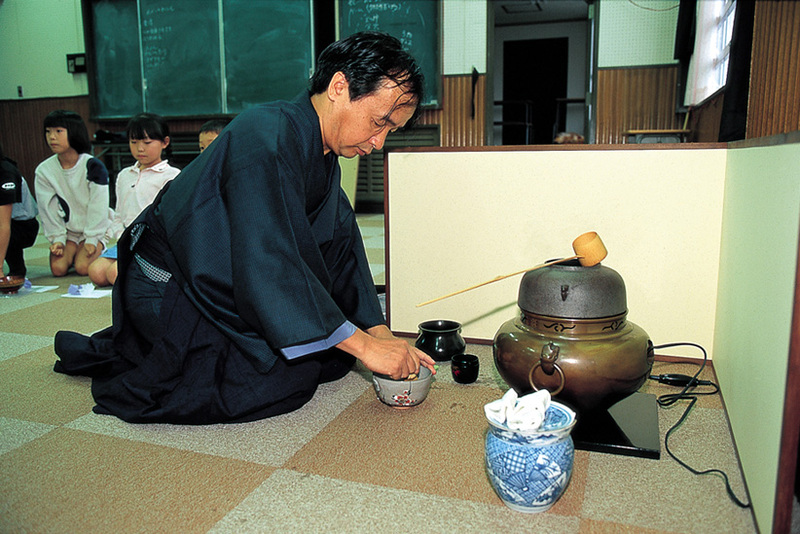 The tea ceremony, perfected by Sen no Rikyu (千利休 せんのりきゅう) (1522-1591), is now practiced by several different schools. The tea ceremony room, the ceremony itself, and the related art of flower arrangement, embody an aesthetic that has both influenced and transcended subsequent generations to the present. The tea ceremony focuses on how the host prepares and offers the tea, and how the guest accepts it. By embodying the prescribed etiquette, participants can share among themselves and understand one another. The tea ceremony is not part of ordinary people's daily routine, but the flavors and fragrances of tea are part of everyone's lives. In June, shincha (新茶 しんちゃ newly harvested tea) comes on the market. Water, too, is important, as good tea depends on good water. Green tea is divided into grades depending on the time of harvest, the portion of the leaf used, and the processing method. The leading variety of green tea, sencha (煎茶 せんちゃ), is made by steaming and then drying and rubbing the tea leaves. Bancha (番茶 ばんちゃ) and hojicha (ほうじ茶 ほうじちゃ) are inexpensive popular teas. Matcha (抹茶 まっちゃ), the tea used in tea ceremony, is made by steaming, drying, and then powdering tea leaves. 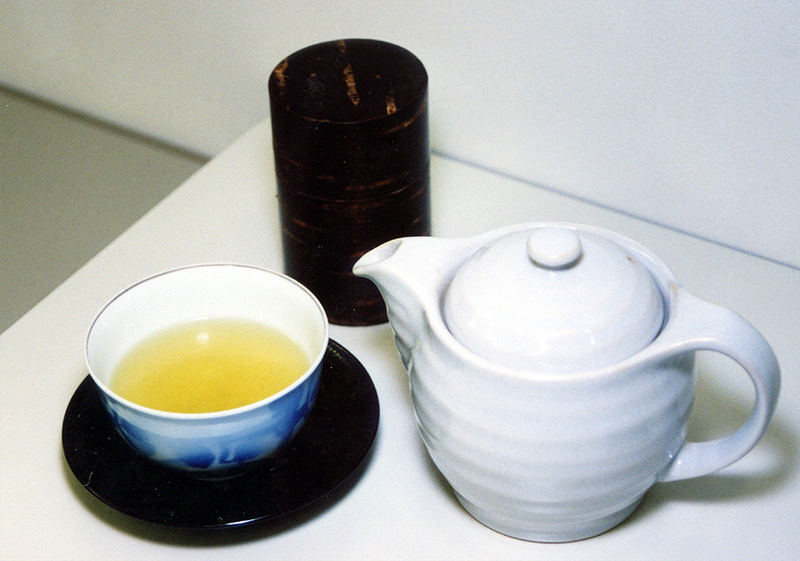 The most common kind of green tea served is made in a kyusu (急須 きゅうす tea pot), and served in handle-less tea cups (yunomi). It is consumed plain, without adding sugar or milk/cream. The finer traditions of serving tea involve paying attention to the season, the variety of tea, the utensils used, and the person being served. Guests are served a higher grade of tea than routinely served in the household. Summer tea is served cold in a cool-looking cup. High-grade tea is high in caffeine, so a child's portion may be watered down or made from tea with less caffeine. Black tea and coffee now present a substantial challenge to green tea, once the universal beverage, and "refreshment," sports, and nutritional drinks are also quite popular among young people. Still, the wide variety of canned tea now being sold in vending machines is testimony to green tea's enduring popularity. Green tea is a stimulant (having caffeine and vitamins C and B2). It fights bacteria, reduces aches, alleviates fever (with tannic acid), helps normalize digestion, and is low in calories. Matcha ice cream, cake, and other tea-flavored products are also available.